View a guide through the 15 areas of the Diba Jimooyung permanent exhibit. It is believed long before the Light-Skinned people arrived, prophets visited the Anishinabek when they were living a peaceful life on the East Coast of North America. View part 1 of a series Kinoomaagewin Mzinigas (Little Teaching Books). We need to know the teachings of our Grandmothers and Grandfathers to give us direction and balance. View part 2 of a series Kinoomaagewin Mzinigas (Little Teaching Books). Anishinabek family groups were assigned the role and responsibilities of a particular animal that lived in their region. This then became their clan. View part 3 of a series Kinoomaagewin Mzinigas (Little Teaching Books). Anishinabek stories tell us long ago of when the Anishinabe spirit uncle, Nenaboozhoo, found the Anishinabek people lying in a grove underneath a maple tree letting the maple syrup drip into their mouths. View part 4 of a series Kinoomaagewin Mzinigas (Little Teaching Books). When the Anishinabe ancestors came to the Great Lakes region they found manoomin (wild rice) growing in the inland lakes. View part 5 of a series Kinoomaagewin Mzinigas (Little Teaching Books). Read about the story of the Anishinabe spirit uncle, Nenaboozhoo, and how the birch tree came to be protection to benefit the people. A 161 page look at the captivating history of the Saginaw Chippewa Indian Tribe of Michigan told in the words of Anishinabe men and women from older times. Stories and accounts that happened before the coming of Europeans - along with stories and accounts that happened after European and American contact. 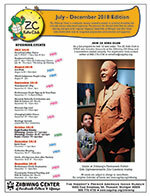 Have the opportunity to take home the history told within the Ziibiwing Center. Enclosed are pictures and descriptions of the steps taken throughout the permanent exhibit. View the 7th Indigenous Peoples Art Market participant's biographies. View the 8th Indigenous Peoples Art Market participant's biographies. View a report from 2004-2008 of the journey our organization has taken since the Ziibiwing Center opened its doors on May 21, 2004. View a biannual electronic newsletter from the Ziibiwing Center focused towards addressing activities and events for children active in the ZC Kids Club. The Ziibiwing Center has developed an American Indian Boarding Schools Supplementary Curriculum Guide to promote the exploration and analysis of the U.S. Government's policy to remove American Indian children from their homes for the purpose of providing them with an "education." A formalized cultural and educational (curricula) program tool for Educators that aligns with specific Grade Level Content Expectations and Michigan Department of Education curriculum standards.